A fast ion passing through a solid releases its energy to the target material, as a consequence many molecular bonds are broken along the ion-track and, in a very short time (one picosec or less), the radicals and molecular fragments recombine giving rise to a rearrangement in the chemical structure. As a consequence, in addition to the alteration of the chemical and lattice structure of the target material, new molecular species (not present before irradiation) are formed. Our group is mainly involved in the experimental study of the effects induced by fast ions and, recently, UV Lyman-alpha photons in solids (frozen gases, carbonaceous and organic materials, silicates etc.) of astrophysical interest and not. 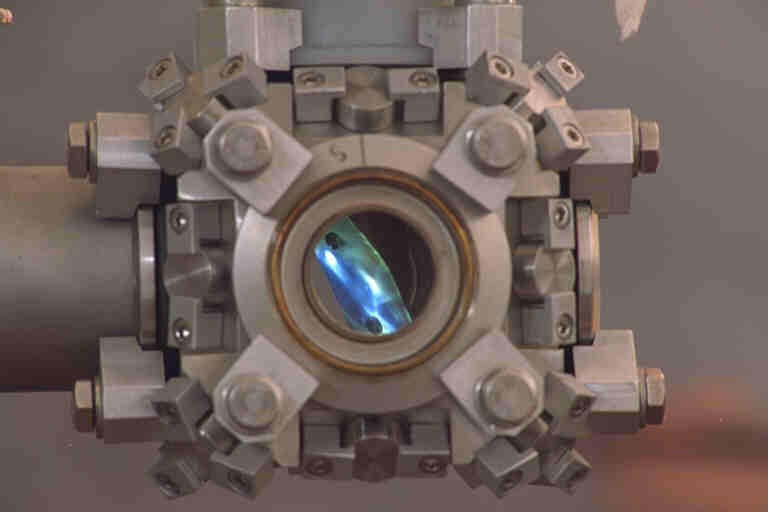 The "in situ" techniques used to analyze the effects of irradiation are Infrared, Raman and UV-VIS-NIR spectroscopy. The results have been applied to various astrophysical scenarios and some of the most significant are reported in the next together with our research programs and activities. Infrared spectra of many protostars show an absorption feature at 4.62 (m. Although a nitrogen-bearing species has been implicated through a comparison with laboratory data, the feature has not yet been unambiguously identified. Ion irradiation experiments carried out on mixtures containing nitrogen-bearing compounds have shown that N2, which is a more likely interstellar ice component than NH3, can be the molecular progenitor of the carrier of the interstellar XCN band. In fact this feature does not appear after UV photolysis of mixtures containing N2; hence UV laboratory experiments have exclusively considered NH3 as the molecular precursor of nitrogen to form the XCN feature. A study is in progress in our laboratory on the properties of the organic residues formed after irradiation of ice mixtures made of H-, C-, N-, and O-containing species. We plane also to study, in the same experimental apparatus, the X-CN formation obtained by ions and/or UV irradiation with the aim to contribute to solve the still open problem of the attribution of the X-CN species. The study of CN-bearing molecules could be also relevant for the origin of life on our planet. Indeed the delivery of CN-bearing molecules to the early Earth may have been necessary as the production of pre-biotic molecules containing the cyanogen bond is difficult in an environment that is not overly reducing and several studies have suggested that early Earth environment might have been just that. The identification of the interstellar 4.62 micrometers band may include the identification of an extraterrestrial source of X-CN. The effects of ion irradiation on the structure of ices have been studied at LASP since 1991 (Strazzulla et al. 1991, Baratta et al. 1991 up to Leto & Baratta 2003) with the aim to understand what could be the impact of this process in astrophysics (Baratta et al. 1991, Baratta et al. 1994, Leto & Baratta 2003). We concentrated our attention to the water ice since it is an ubiquitous material in space, on the surface of planets and their moons, in comets and interstellar dust grains. But other ices are today object of further studies. The structure of water ice strongly depends on the deposition temperature. It is amorphous if deposited at low temperature, i.e. 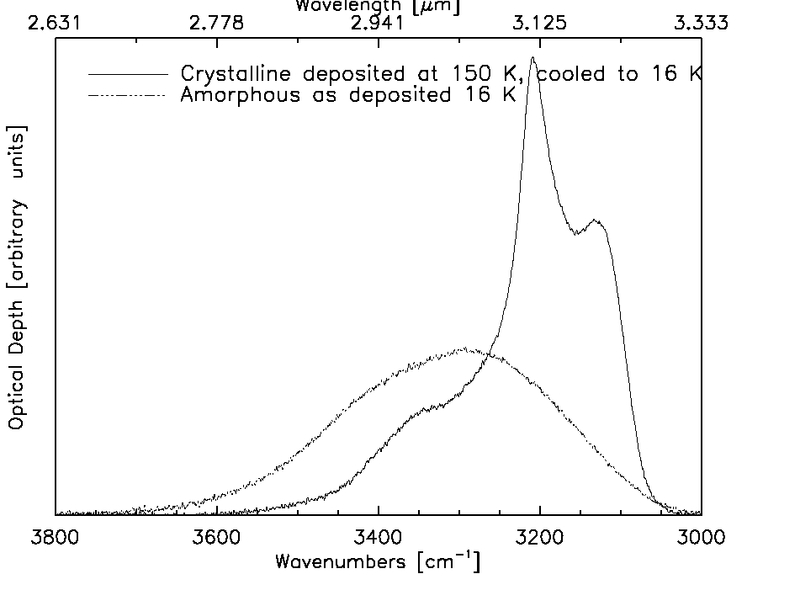 16 K, or crystalline if the deposition temperature is higher than 140 K. The profiles of the infrared absorption features of water ice depends on the structure of the ice. As an example in the figure the 3-micron band (the most intense in the mid IR) is displayed for cubic ice obtained by depositing H2O vapor at 150 K and cooling to 16 K, and for an amorphous ice sample of the same thickness directly deposited at 16 K. Their profiles (peak position, shape, strength) are very different. Thus IR spectroscopy in the 3-micron region was our first choice technique to investigate structural changes of water ice. The general effect of the ion irradiation on the structure of an ice sample is a gradual amorphization of the sample. The percentage of the amorphization depends on the temperature of the ice layer and on the total amount of energy deposited per molecule. The overall behaviour of the physical process was described in Strazzulla et al. 1992, in which also the parameters of the process were given for the case of 3 keV He+ irradiation in the temperature range between 10 and 100 K.
UV irradiation of ices produces the same effect of ion irradiation, Leto & Baratta 2003 have demonstrated that UV Lyman alpha photons do produce amorphization. New irradiation/photolysis experiments were carried out with the same experimental apparatus by using Ar++ 60 and 30 keV ions, H+ and He+ 30 keV ions, and Lyman alpha photons. The results indicate that also the energy budget necessary to amorphize water ice is the same whithin the experimental errors in both ion irradiation and photolysis process. Solid surfaces of atmosphere-less objects in the Solar System are continuously irradiated by energetic ions (from solar wind and flares, from planetary magnetospheres, and cosmic rays). Reactive ions (e.g., H, C, N, O, S) induce all of the effects of any other ion including the synthesis of molecular species originally not present in the target. In addition these ions have a chance, by implantation in the target, to form new species containing the projectile. In our laboratory an ongoing research program consists in the study of the implantation of reactive ions to verify if and when new molecules are synthesized that contain the projectile. In fact when the penetration depth of the incoming (reactive) ions is lower than the thickness of the target, these ions are stopped (implanted) into the ice. Incoming ions deposit energy in the target, as unreactive ions also do. Each incoming ion having energies between 10 and 100 keV, breaks 103-104 bonds and a large number of new molecules can be formed per single incoming ion by recombination of fragments of the irradiated species. In addition only reactive ions have a chance to form species that include the projectile with a maximum yield of one molecule per incoming ion. Implantation experiments are particularly relevant for application to objects in the Solar System where ices on planetary surfaces, comets, etc., are much thicker than the penetration depth of the relevant ion populations. In fact there is a possibility to detect, on planetary surfaces, molecular species not necessarily native of that object but formed by implantation of incoming reactive ions. Recent results obtained by implanting carbon and nitrogen ions in water ice at 16 and 77 K are available in Strazzulla et al. 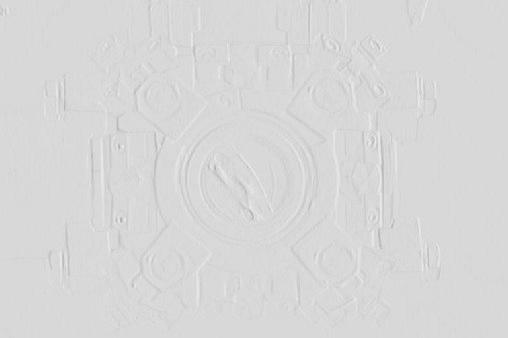 2003 (in press). Carbon implantation produces carbon dioxide and the production yield has been measured. Nitrogen implantation does not produce any N-bearing species that is detectable by IR spectroscopy. Both ions have also the capability to synthesize hydrogen peroxide at the two investigated temperatures. We show that although a relevant quantity of CO2 can be formed, by C implantation in the icy Jovian moons, however this is not the dominant formation mechanism of carbon dioxide. Solid objects in space (interstellar grains, comets, interplanetary dust particles), are continuously exposed to energetic processes such as cosmic rays and UV photons. Although the effects induced by such physical agents have been studied in laboratory for several years, up to now no experimental study of the combined effects induced by fast ions and UV photons on frozen gases of astrophysical interest has been carried out. The effects induced by ions or UV photons could be enhanced or depleted and new effects could appear if the frozen is simultaneously irradiated (or has been already irradiated) with UV photons or ions respectively. For example, sputtering of water ice by fast ions may be enhanced because of precursor radicals produced by ultraviolet radiation (Westley et al. 1995). Recently we added a Lyman-alpha microwave powered lamp to our experimental apparatus. This gives us the capability to study (by using 'in situ' Infrared and Raman spectroscopy) the effects induced by fast ions and UV photons on frozen gases and solids. The experimental apparatus has been designed for a continuous monitoring of the ions and UV flux, this allows a reliable comparison and quantification of the effects induced by these agents. By using this apparatus we found that the chemical evolution of UV and ion irradiated molecular ices can be very different (Baratta et al. 2002). It is well known that particle shape and size can have very important effects on the profile of icy absorption features. In fact Mie-scattering calculations show that absorption features can be shifted with respect to laboratory (bulk) spectra of thin films and subpeaks appear. The difference between bulk spectra and small particle extinction spectra depends on the optical constants (n,k) of the sample and in particular it is not negligible for those species with "strong transitions" and at high concentration in the ice mixture. In order to know whether a band profile in a specific ice mixture would be affected by particle shape and size effects it would be necessary to have the optical constants of that mixture and perform small particles cross-section calculations. However if in principle optical constants can always be measured in practice this is not straightforward. After several years of experiments and IR spectroscopy of icy mixtures we have found an experimental method to know whether particle shape and size would affect the profile of an absorption feature and hence whether laboratory spectra of thin films are representative of small particles extincion spectra. In particular, we have found that some instances exist in laboratory spectra for which the profile of absorption bands depends on the inclination of the ice film with respect to the infrared beam of the spectrometer. Furthermore when this is the case if the spectrum is taken at oblique incidence the band profile depends on the polarization of the infrared beam as well. We have shown that when a band profile in a laboratory spectrum depends on the inclination of the sample or, equivalently, on the polarization of the electric vector of the IR beam this cannot be directly compared to astronomical observations (Baratta et al. 2000, Palumbo et al. 2000).